How to Downgrade to iOS 4 from iOS 5 using TinyUmbrella? iOS 5 usage was such a pleasure but after sometime when you realize that you are not able to get network connection which makes it a big minus point of the Beta Version, that is when you change your mind to get back to the previous version of the iOS that is the iOS 4 which is nearly impossible if you want to do it the official way. 4. Remove any previously made host file changes (manually or with TinyUmbrella). Note: This process should be started without connecting your iPhone iPad or iTouch to your Mac or Windows PC. Uncheck the box that says “Set Host to Cydia On Exit” This will change your settings, so better be Unchecked before anything happens. After you have started your computer you need to launch iTunes with your iOS device already connected to it. Hold down both the Sleep Button (on top of your device) and the Home Button (on the front underneath the screen). If the screen stays black, that’s it! Your iPhone, iPod touch, or iPad should now be in DFU mode. Once you have successfully put your device into DFU mode go to iTunes which will be showing you a Error message in a box stating ” A device has been found in recovery mode” which has to be restored. 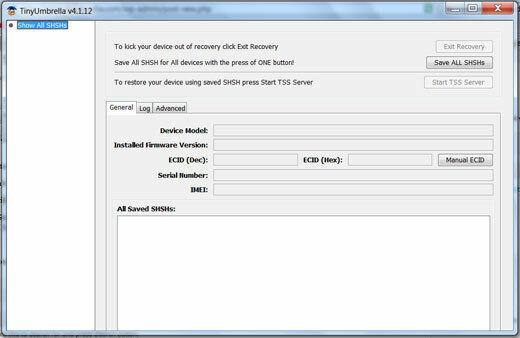 Now you can happily restore your device to your desired iOS 4 firmware which you have downloaded earlier.